Switch off the engine, ignition, mobile telephone and auxiliary heater before filling the tank and leave them switched off during refilling. Unlock the vehicle with the vehicle key or press the central locking button on the driver door to unlock the vehicle from the inside . Press the rear of the tank flap to open it. MultiFuel engines can be run either with petrol (RON 95) or with bioethanol E85, and with all mixtures of these two fuels . The proportion of bioethanol contained in the fuel must not exceed 85% . 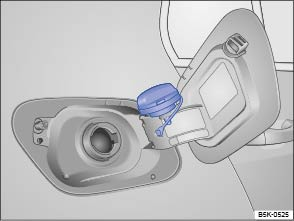 The procedure for refilling the vehicle is the same as for refilling with petrol . After refuelling with a mixture of bioethanol and petrol, drive for at least five minutes so the engine can adapt optimally to the current mixture. During this period the idling engine speed can vary. During this period, do not drive at top speed, use high engine revs or depress the accelerator fully. Always use the correct mixture for bioethanol in order to prevent damage to the engine and fuel system.